President Trump came up with a brilliant idea to make sure Chuck and Nancy have no choice but to listen to the American people. 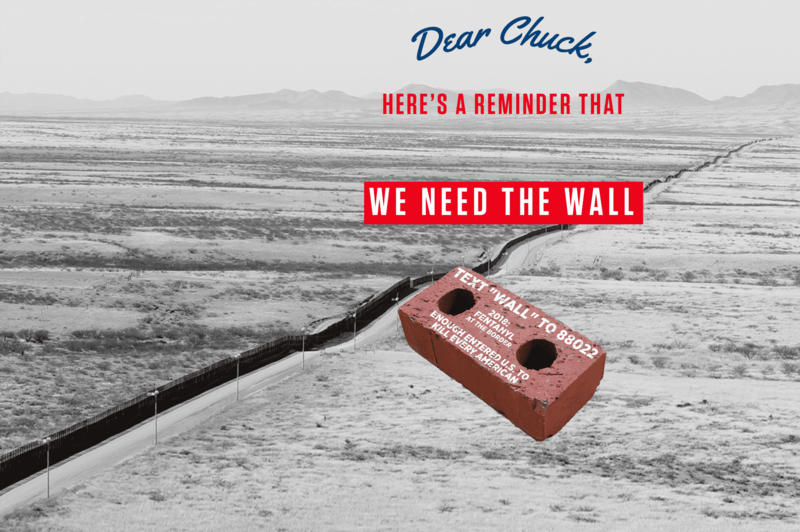 Please make a contribution of at least $20.20 by MIDNIGHT TONIGHT and we will send your brick directly to Chuck Schumer's office. Trump Make America Great Again Committee (“TMAGAC”) is a joint fundraising committee composed of Donald J. Trump for President, Inc. (“DJTP”) and the Republican National Committee (“RNC”). Contributions to TMAGAC or any member committee are not deductible for federal income tax purposes. Contributions to TMAGAC are subject to federal contribution limits and prohibitions. Federal law requires us to collect and report the name, mailing address, occupation, and employer of each contributor whose contributions aggregate in excess of $200 in a calendar year (RNC) or election cycle (DJTP). 75% of each contribution to DJTP, to be designated toward either its 2020 primary (which shall be the default) or 2020 general election account, up to a maximum of $2,800 ($5,000) per account. 25% of each contribution to the RNC’s Operating account, up to a maximum of $35,500 ($15,000). Notwithstanding this allocation formula, a contributor may designate a contribution for a specific participant or participants. In addition, the allocation formula may change if any contribution would exceed applicable contribution limits. By providing your phone number, you are consenting to receive calls and SMS/MMS messages, including autodialed and automated calls and texts, to that number from each of the participating committees in the Trump Make America Great Again Committee, Donald J. Trump for President Inc. and the Republican National Committee. Msg & data rates may apply. Participating committees’ terms & conditions/privacy policies apply: http://88022-info.com/ (DJTP); http://80810-info.com/ (RNC). Neither printed nor produced at government expense. Please provide your full name, mailing address, email address, occupation, and employer with your mailed contribution.